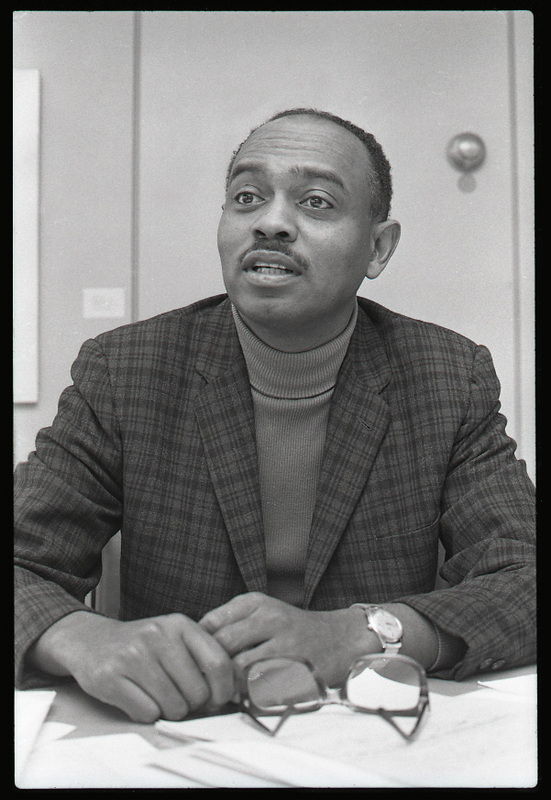 A composer, performer, poet, educator, and arts administrator, Fred Tillis was one of the major influences on the cultural life at UMass Amherst for forty years. Born in Galveston, Texas, in 1930, Tillis began playing jazz trumpet and saxophone even before his teens. A product of segregated schools, he graduated from Wiley College at the age of 19, and received his MA and PhD in music at the University of Iowa. As a performer and composer of unusual breadth, his work spans both the jazz and European traditions, and he has written for piano and voice, orchestra, choral pieces, chamber music, and in the African American spiritual tradition, drawing upon a wide range of cultural references. After teaching at Wiley, Grambling, and Kentucky State in the 1960s, Tillis was recruited to UMass in 1970 by his former adviser at Iowa, Philip Bezanson, to teach music composition and theory. Earning promotion to Professor in 1973, Tillis was appointed Director of the Fine Arts Center in 1978, helping to jump start some of the most successful arts initiatives the university has seen, including the the Afro American Music and Jazz program, the New World Theater, Augusta Savage Gallery, Asian Arts and Culture Program, and Jazz in July. Upon retirement from UMass in 1997, he was appointed Emeritus Director of the Fine Arts and remains active as a musician and poet. The Tillis papers document an extraordinary career in the arts, focused on Fred Tillis’s work as a composer. Consisting primarily of musical scores along with an assortment of professional correspondence relating to his publishing and miscellaneous notes, the collection offers insight into the evolution of Tillis’s musical vision from the 1970s into the new millennium. As a composer, performer, poet, educator, and arts administrator, Fred Tillis profoundly shaped the cultural and musical aspects of life at UMass Amherst for forty years from 1970-2010. Born in Galveston, Texas, in 1930, Tillis began to play jazz trumpet and saxophone before his teens. As a performer and composer of unusual breadth, his work spans both the jazz and European traditions, and he has written for piano and voice, orchestra, choral pieces, chamber music, and in the African American spiritual tradition, drawing upon a wide range of cultural references. Growing up in a segregated school system, Tillis enrolled in Wiley Collegeâ€”a college for African American studentsâ€”when he was only 16, and graduated with his Bachelorâ€™s at age 19. Immediately upon graduating from Wiley, he began to teach at the college, beginning a long career in music education. Following a year of teaching full-time at Wiley, Tills received his Master’s from the University of Iowa under Phillip Bezanson in 1952. After a four-year hiatus serving in the Army Air Coreâ€”eventually serving as director of the Air Force bandâ€”Tillis then returned to teaching at Wiley and North Texas State for four years before returning to the University of Iowa to receive his PhD. From 1964 to 1970, Tillis taught at various universities until he was recruited by his former teacher Phillip Bezanson to come teach full time at the University of Massachusetts Amherst. While at UMass, Tillis founded numerous programs and courses of study that greatly enriched the life of music majors and the general student body at the University. In 1978, Tillis was appointed the Director of the Fine Arts Center and helped start some of the Universityâ€™s most successful art initiatives, including the Afro American Music and Jazz program, the New World Theater, Augusta Savage Gallery, Asian Arts and Culture Program, and the Jazz in July teaching program. Tillis was a part of a generation of instructors and administrators of colorâ€”including Roberta Uno; Max Roach; and Chancellor Ralph Bromeryâ€”who helped bring non-traditional courses of study and programs to the University, greatly increasing the diversity of both its student body and curricula. Upon retirement from UMass in 1997, Tillis was appointed Emeritus Director of the Fine Arts Center and remains active as a musician and poet. The Tillis papers document an extraordinary career in the arts and in arts administration, focused largely on Tillisâ€™ role as a composer and poet. The collection includes a large number of original compositions, including multiple drafts over many years, allowing researchers to view his creative process over time. Some of the compositions include his â€œSpiritual Fantasyâ€ series and â€œIn the Spirit and the Fleshâ€, two of his most in-depth pieces, as well as compositions from before his time at UMass. There is also an assortment of professional correspondence between Tillis and his publisher, as well as miscellaneous documents detailing the development of the Fine Arts Center. Taken together, the collection offers insight to the development of Tillisâ€™s vision and UMass cultural life as a whole from the 1970s into the new millennium. The subject files in Series 1 reflect Tillis’s work as an administrator, teacher, and leader in the UMass community through lectures, correspondence, and a wide variety of administrative files. These files center around Tillis’s leadership of the Fine Arts Center and document the Center’s development, management, and its groundbreaking arts programming. Series 2 contains manuscript and printed scores for Tillis’s compositions, in many cases including multiple drafts. These compositions span a significant portion of Tillis’s musical career and reflect both the breadth of his musical inspiration and the details of his creative process in developing each composition. Acquired from Frederick Tillis, 1999 and 2013. Processed by James Fahey, September 2013. Cite as: Frederick Tillis Papers (FS 156). Special Collections and University Archives, University of Massachusetts Amherst Libraries.